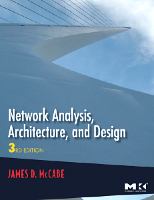 Welcome to the website for McCabe, J: Network Analysis, Architecture, and Design, 3rd Edition. "Many times, network designers are tempted to find instant gratification by jumping directly into implementation without first fully understanding the scope of their problem.When this occurs, the result can be a network that does not function as needed, or even worse, the solution can create additional problems. Network Analysis, Architecture, and Design provides the reader with design methods they can use to avoid this and other common pitfalls.James McCabe takes the reader step-by-step through proven processes that will result in designs that are not only viable, but designs that will stand up to the scrutiny of technical and financial reviews.I have successfully applied these techniques to many of my projects, and I recommend this book to network designers and engineers of all levels."